Houston's Charlie Morton allowed six hits and three runs in 4 1/3 innings. 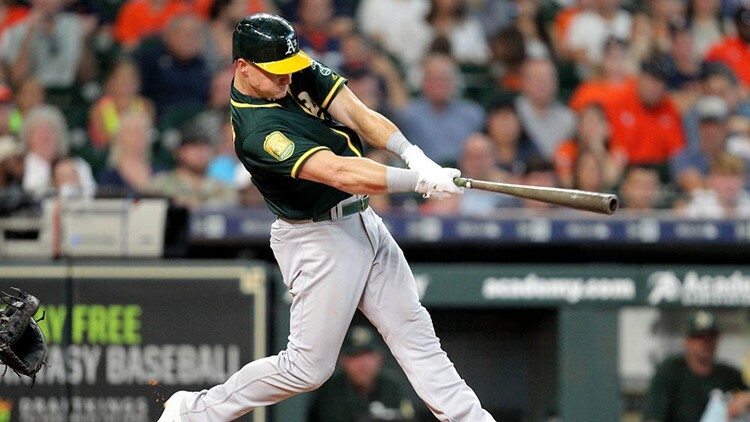 HOUSTON -- Mark Canha's two-RBI single in Oakland's three-run eighth inning lifted the Athletics to a 6-4 win over the Houston Astros on Thursday. The Athletics fell behind early but cut the lead to one with a three-run fifth. An RBI double by Matt Chapman tied it with no outs in the eighth before Canha's single off Chris Devenski (2-2) with one out made it 6-4. Canha's hit landed in the corner of left field and the Astros challenged the ruling that the ball was fair, but the call was upheld. It was another big eighth inning for the A's, who lead the majors with 69 runs in the inning this season. This one helped them take three out of four against the Astros. Nick Martini had three hits and drove in two runs for the Athletics, who are 19-5 in their last 24 games. Alex Bregman drove in two with a double in the third and Tony Kemp's two-run homer made it 4-0 in the fourth. Khris Davis extended his career-long hitting streak to 14 games with a single to get things going in the eighth, and Matt Olson followed with a single. The double by Chapman to left field scored Davis to tie it at 4. Stephen Piscotty hit an RBI double with one out to end Morton's day. Astros: INF Marwin Gonzalez returned after missing a game after taking a cleat to the left wrist on Tuesday night. ... SS Carlos Correa (back stiffness) will have to go on a rehabilitation assignment before he comes off the disabled list, so he will not play before the All-Star break.